The Bible talks about fruit but its a different kind of fruit, it's called the fruit of the Spirit. The fruit of the Spirit is a little like real fruit because they are each special and different too. It's really neat because when we ask Jesus to live in us his Spirit stays with us and He will give us some of this special fruit. As we grow and learn more about Jesus, the Spirit will give us more and more fruit and become more Christ-like. I will tell you in a minute what this special fruit is but first I want to explain how God can be God, Jesus (His son) and the Spirit all at the same time. The fruit of the Spirit is love, joy, peace, patience, kindness, goodness, faithfulness, gentleness and self control. 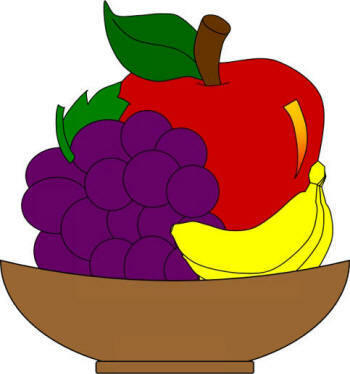 All of these fruits are good to have and the Spirit wants to give them to us. God wants us to try to be good and have the fruit of the spirit in us. We can try to have love, joy, peace, patience, kindness, goodness, faithfulness, gentleness, and self control but the Spirit will give us the kind of gifts he wants us to have. It's hard to do it on our own, we need the Spirit to help us with each of these things. Just in case you don't know what each of the fruit of the spirit means I'm going to try to explain them. I think the easiest fruit of the spirit to explain is love. Think of someone that loves you no matter what. You can make mistakes and it doesn't matter what you look like, but they still love you. God loves us too, no matter what, he even loves you more than your parents! He can help us love others the way we should. The next fruit is joy. Joy is like being very, very happy, it's being happy inside even when things aren't going great. Again, we can try to be joyful but only God can give us the kind of happiness that makes us joyful, we can't just be joyful on our own. When we think of peace, we usually think of no more fighting or war. That is right, but the peace of the spirit is a bit different. This is the peace we get when we get to know God really well (by reading the Bible, praying, asking questions, etc). If we have this peace we will feel a calmness inside and know that all our sins are confessed and that God forgives us. Patience is the next one and I'm sure we know what this means. Have you ever been told to have patience? The patience God is talking about is for those little things like waiting to open your Christmas presents or being patient to go to the park. But it also means to be patient for answers to prayer that might take years to be answered. Next is kindness and it should be easy although sometimes it's not. Is it easy to be kind to someone who has been mean to you or to a beggar on the street? When God gives us this gift, its more than just being kind to others. He might help us be kind to someone who really needs it and we're not even aware of it. For example, maybe you feel like you should write a letter or call a grandparent. God might be urging you to do that because they are having a bad day and that's exactly what they need to cheer them up. Sometimes your kind deed to someone else is all they need to remember that someone special loves them. Being good or goodness is the next fruit of the spirit. Having the gift of goodness means God can depend on me to be honest, repent of my sins, and turn away from bad things. We also need to try to act this way towards others through our actions so they can see the fruit in us. The only true goodness we have is the goodness of God living in us. Faithfulness is next and this one might be a little trickier to understand. Being faithful is keeping your promises, being a loyal friend even when times get tough, being trustworthy and doing the things you said you would do. When I think of faithfulness I think of my grandma who prayed for me every single day of her life. She was faithful in praying for me, which also meant that she prayed everyday. When I think of gentleness I think of holding a brand new baby. For some reason we think they might break if we don't hold them so carefully. The kind of gentleness God is talking about is similar to this. No matter what situation comes up we are supposed to be gentle. That doesn't mean we shouldn't stick up for ourselves, if someone is doing something you know is wrong you should still tell an adult or tell them to stop. Just do it in a gentle way like Jesus would do it. The last fruit is self control and is a very important one, it means to be in control of what we say and do. Without self control we can't do the things we should. To be able to live the way God wants we have to be in control of the things we do. Just like when a brother or sister bugs you so much you just want to hit them, we know that we have to control ourselves and not hit them. We know we just can't do whatever we feel like sometimes because its not right and we'd be punished. Just remember that with all these gifts we need help from God to be able to use the gifts properly. We need to remember that God made us and he is perfect. If you want the fruit of the spirit first you need to ask God to live in you, and then the more you get to know him the more fruit or gifts he will help you have.